The Reds have announced that they’ve designated infielder/outfielder Arismendy Alcantara for assignment. The move clears space for righty Scott Feldman, who returns from the disabled list to start tonight against Milwaukee. Alcantara was once a top prospect who showed good basestealing ability and burgeoning power in the minors, but his stock has fallen in recent years as he’s passed through the Cubs and Athletics organizations. The Reds claimed him from Oakland last October, and he’s batted a very poor .171/.187/.248 (including a 35.2 K% and 1.9 BB%) in 108 plate appearances while playing six positions in the big leagues this season. He’s also out of options, further complicating any hopes the Reds might have had of continuing to carry him on their roster. In parts of four big-league seasons, Alcantara has batted just .189/.235/.315 in 459 plate appearances. The Reds have claimed infielder/outfielder Arismendy Alcantara off waivers from the Athletics, Cincinnati announced. Fellow utility option Patrick Kivlehan — who was claimed just eight days ago from the Padres — was designated for assignment to clear roster space. Alcantara, 24, was once one of the more well-regarded prospects in the Cubs’ minor league ranks, but his promising production at Double-A and Triple-A as a 21-year-old and 22-year-old, respectively, hasn’t carried over to the big league level. Alcantara hit .271/.351/.452 with Double-A Tennessee back in 2013 and followed that up with a huge .307/.353/.537 slash with Triple-A Iowa the following season. Both of those impressive stints fueled a promotion to the Majors in ’14, but Alcantara floundered through 300 plate appearances that year, and his bat regressed at Triple-A in 2015. All told, he’s a career .195/.249/.337 hitter through 351 big league plate appearances, though he did post a respectable .278/.325/.467 slash in 108 Triple-A contests this season. Alcantara has experience playing a slew of positions and can give the Reds another versatile option to move around the diamond. He’s played mostly second base and center field at the Major League level but also has professional experience at shortstop, third base and in both outfield corners. As for Kivlehan, his stay on Cincinnati’s 40-man roster proved to be brief. The former Rangers/Mariners farmhand was claimed off waivers in late September. In the past calendar year, Kivlehan has been traded from the Mariners to the Rangers, only to be sent back to Seattle before being claimed off waivers by the Padres and later by the Reds. He’ll now potentially land with a fifth organization in the past 12 months. The 26-year-old has just 24 big league plate appearances but is a .282/.344/.470 career hitter in the minors, where he’s played both corner infield positions extensively and has seen limited action in all three outfield slots. 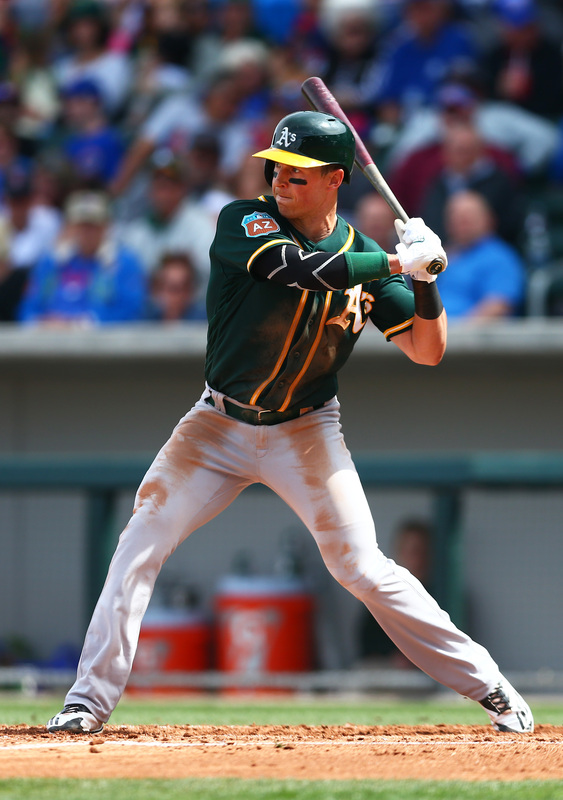 The Cubs have brought back veteran infielder/outfielder Chris Coghlan in a trade with the Athletics, per an announcement from Oakland. Young utilityman Arismendy Alcantara will go back in return. Chicago had shipped Coghlan to the A’s over the winter in exchange for pitcher Aaron Brooks. That move proved to be a precursor to the Cubs’ signing of Dexter Fowler. In the interim, though, the Cubs lost Kyle Schwarber for the season and recently saw Jorge Soler go down with a hamstring injury of unknown severity. Also hitting the DL with a hammy issue is infielder Tommy La Stella. Those losses have reduced the club’s depth somewhat, though it still has a nice group of outfield talent in reserve (including just-promoted prospect Albert Almora) as well as a fully healthy infield that includes two outstanding players (Kris Bryant and Ben Zobrist) who are also capable of playing in the outfield. The 30-year-old Coghlan will likely see time at the corner outfield, but has also been an option at second base (where Zobrist is entrenched). He had two highly productive seasons with the Cubs over 2013-14, posting a combined .265/.346/.447 batting line with 25 home runs and 18 steals over 935 plate appearances. Coghlan has scuffled thus far in Oakland with an ugly .146/.215/.272 slash, but those results and eroding plate discipline — he owns an uncharacteristic 27.3% strikeout rate against a diminished 7.6% walk rate — didn’t deter his former club. There was a time when it would have seemed that Alcantara was the perfect player to plug into just such an opening. A middle infielder by trade, he saw ample time on the outfield grass upon his promotion in 2014. But the 24-year-old has never quite blossomed at the big league level, and wasn’t showing any signs of resolving his strikeout issues at Triple-A. Still, he’s an interesting wild card for the A’s. Though he’s yet to show consistent on-base skills, Alcantara is generally regarded as a quality fielder and has loud tools on offense, with a history of double-digit home runs and steals. Indeed, over 213 plate appearances at the highest level of the minors this year, he has already swiped twenty bags. Here are reactions to and fallout from today’s trade between the Cubs and Astros, which sent Dexter Fowler to Chicago for Luis Valbuena and Dan Straily. Cubs GM Jed Hoyer says the two teams had been discussing a Fowler trade since last month, Jesse Rogers of ESPN Chicago tweets. The Cubs and Astros are suddenly looking to be competitive in 2015, and the Fowler trade was about making each of their rosters more complete, Eno Sarris of Fangraphs writes. The Cubs had plenty of infield talent but were thin in the outfield, and sending Valbuena to the Cubs gives them more flexibility to figure out what to do with Kris Bryant, Arismendy Alcantara and Javier Baez while giving them a veteran outfielder who they might also be able to extend a qualifying offer after the season. Meanwhile, Valbuena improves the Astros at third base while clearing space for some combination of Jake Marisnick and Robbie Grossman in the outfield. Valbuena’s departure assures that Kris Bryant will begin his big-league career at a third baseman and not as an outfielder, Rogers writes. Meanwhile, the Cubs will have Alcantara play a number of positions, remaining open to the idea that he could emerge as a starter at one of them. As a former player, Dodgers manager Don Mattingly can relate to what Cubs prospects Javier Baez and Arismendy Alcantara are going through, writes David Just of the Chicago Sun-Times. “It’s just a time factor with the young guys,” Mattingly said. “They can look good right away, and the next year they come out and it doesn’t look good. Or they can look kind of shaky and figure a lot of it out. So time is going to tell.” As a youngster, Mattingly got off to a slow start with the Yankees, hitting .278 with a .326 on-base percentage in his first 98 games during the 1982 and ’83 seasons. He then led the American League in hits, doubles, and batting average in 1984. Brewers GM Doug Melvin does not “think there’s a need to go out and try to get another starter” and will instead focus on offense this offseason, reports MLB.com’s Adam McCalvy. The Brewers are all but certain to pick up the $13MM option on Yovani Gallardo, McCalvy opines. The Brewers’ biggest offseason decisions will be the infield corners and whether to exercise Gallardo’s option, according to Tom Haudricourt of the Milwaukee Journal Sentinel in a recent chat. The Brewers will consider both internal and external options at first base, but Haudricourt notes finding productive first basemen is easier said than done. “What we’d really like is to have a bunch of really good baserunners,” is what Cubs manager Rick Renteria told reporters, including MLB.com’s Carrie Muskat, when asked about the club’s 2015 wish list. The next game that Aramis Ramirez plays will be the 2,000th of his Major League career, but the Brewers’ third baseman doesn’t sound like he plans on calling it quits anytime soon. Ramirez told reporters today, including Tom Haudricourt of the Milwaukee Journal-Sentinel, that he plans to try to play another 500 games: “I’m going to go for 2,500 (games) so let’s see what happens. … I’m playing past this year, for sure. I don’t know how much longer but definitely more years.” Ramirez’s contract contains a $14MM mutual option with a $4MM buyout. Given the rarity with which mutual options are exercised, there seems to be a good chance that Ramirez could hit the open market as a free agent this winter. The Pirates are scouting the Diamondbacks’ bullpen of late, tweets Jon Paul Morosi of FOX Sports, who speculates that old friend Oliver Perez could be a potential target for the Bucs. The Reds and Phillies remain in contact regarding a potential Marlon Byrd trade, sources tell Jim Bowden of MLB Network Radio and ESPN (Twitter link). The Reds have Jay Bruce in right and Billy Hamilton in left, but their left fielders have combined to hit .242/.304/.358. Additionally, with Bruce’s slumping and Joey Votto on the disabled list, the team is short on power. Cubs GM Jed Hoyer tells Carrie Muskat of MLB.com that Arismendy Alcantara will likely be in the lineup everyday, splitting time between second base and center field. The Cubs designated defensive specialist Darwin Barney for assignment yesterday, which should clear some playing time for the 22-year-old Alcantara. Alcantara isn’t the only Cubs prospect on the rise. Bruce Miles of the Daily Herald tweets that outfielders Jorge Soler and Albert Almora have each moved up a level, with Almora heading to Double-A Tennessee and Soler reaching Triple-A Iowa. David Price, who recently took in a game at Busch Stadium in St. Louis, told Bob Nightengale of USA Today that the fans of St. Louis were great and treated him well in his time there. One high-ranking AL exec tells Nightengale that if the Rays decide to move their ace, the Cardinals stand out as the most likely team to acquire him. MLB.com’s Jen Langosch was among the reporters who spoke to Cardinals GM John Mozeliak yesterday. Langosch writes that the Redbirds are pursuing rotation help as the deadline approaches, but Mozeliak cautioned that no deal is imminent. Asked if the club was pursuing a top-of-the-rotation arm or some depth for the back end, Mozeliak replied that the latter was more likely. Originally recalled for a two-day period with Darwin Barney on paternity leave, Cubs second baseman Arismendy Alcantara has been informed that he will be with the team at least through the All-Star break, reports Gordon Wittenmyer of the Chicago Sun-Times. Alcantara, who ranked 33rd on Baseball America’s midseason list of the game’s Top 50 prospects, says he was surprised by the news. Manager Rick Renteria offered praise for the 22-year-old, who collected his first four Major League hits in today’s contest. Reds right-hander Homer Bailey left today’s game after five innings due to a slight strain in his right knee, but he won’t see his name added to the list of significant injuries that have stricken contending teams today. The Reds have announced that he is expected to make his next start. The Indians are hopeful that Justin Masterson’s two weeks on the disabled list will not only give him a chance to heal, but to help him get his mechanics back in line, reports MLB.com’s Jordan Bastian. Pitching coach Mickey Callaway feels that Masterson’s knee has affected the way he’s been able to land during his delivery, which would explain the sharp decrease in velocity Masterson has seen this year. White Sox GM Rick Hahn would need to receive an offer that knocks his cell phone out of his hands in order to trade Chris Sale, Jose Quintana, Avisail Garcia or Jose Abreu, writes Scott Merkin of MLB.com. However, Hahn notes that oftentimes, a trade will come together when a rival club’s initial inquiry is on a player that is unavailable, as it leads to the suggestion of alternative options.